Something rather fishy occurred within the past few hours at CNN.com. The package, which passed the Senate 81-16, will send rebate checks to 130 million Americans in amounts of $300 to $600 for people who have an income between $3,000 and $75,000, plus $300 per child. Couples earning up to $150,000 would get $1,200. The checks are an advance on next year's refunds, and most, if not all of the money, will be deducted from taxpayers' refunds in 12 months' time. The (tax rebate) checks are an advance on next year's refunds, and most, if not all of the money, will be deducted from taxpayers' refunds in 12 months' time. 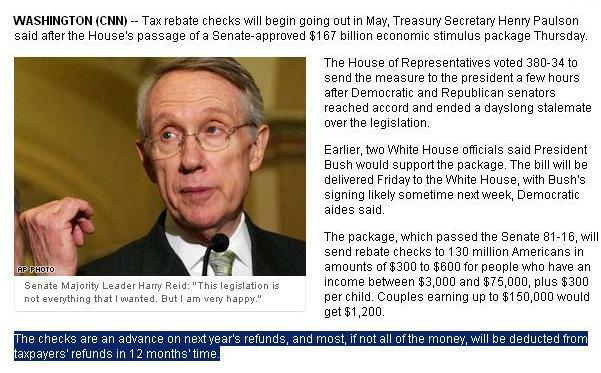 If this is right, the vaunted "rebates" are in fact loans to be repaid on next year's taxes. So I'm going to get a check that I haven't asked for, and that check is going to increase my tax liability next year, and for this I'm supposed to be grateful? Can this possibly be true, or is it some kind of misprint? Several other blogs have noticed this as well. This raises two interesting questions: Is this sentence true, and CNN just doesn't want readers to know about it, or; did the author get it wrong, and CNN did a fast delete rather than an update with a retraction?